Last week’s (February 1, 2019) release by the US Bureau of Labor Statistics (BLS) of their latest labour market data – Employment Situation Summary – January 2019 – showed that total non-farm payroll employment rose by 304,000 and the unemployment rate rose by 0.1 points to 4 per cent on the back of a 0.1 points rise in the participation rate. The labour force survey estimates were significantly impacted by changes in population benchmarks (an annual occurrence). However, all indications are that the labour market continues to improve. 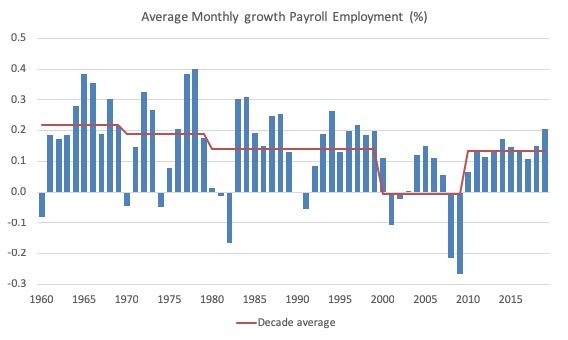 We will see in the next few months whether the strong January payroll employment growth was a one-off blip or a sustained trend. While the US labour market is looking fairly robust there is still a substantial jobs deficit remaining which tells us that it remains some distance from full employment. And, my latest analysis on which occupations are enjoying the employment growth shows that there has been a distinct hollowing out of median pay jobs (the so-called ‘middle class’ jobs), which helps to explain the sharp increases in income inequality. Payroll employment rose by 304,000. Total labour force survey employment rose by 237 thousand in net terms after taking out changes due to variations in population benchmarks. The seasonally adjusted labour force rose by 495 thousand which pushed the unemployment rate up a bit. Official unemployment rose by 241,000 to 6.535 million. The official unemployment rate rose 0.1 points to 4 per cent. The participation rate rose by 0.1 points to 63.2 per cent but remains well below the peak in December 2006 (66.4 per cent). Adjusting for age effects, the rise in those who have given up looking for work for one reason or another since December 2006 is around 5,041 thousand workers. The corresponding unemployment rate would be 6.9 per cent, far higher than the current official rate. The broad labour underutilisation measure (U6) rose sharply from 7.6 per cent to 8.1 per cent due mainly to the enforced shutdown. This month’s data was affected by new population benchmarks which are used to scale up the survey data to national level. With the changes to the population benchmarks, the household and establishment survey data diverged significantly this month. I analyse the differences below. Establishment survey data have been revised as a result of the annual benchmarking process and the updating of seasonal adjustment factors. Also, household survey data for January 2019 reflect updated population estimates. The monthly changes were stronger in 2014 and 2015, and then dipped in the first-half of 2016. By the end of 2016, job creation was stronger but then it tailed off again, somewhat. This month was much more robust than the average over the last several years. We will wait to see if it lasts. 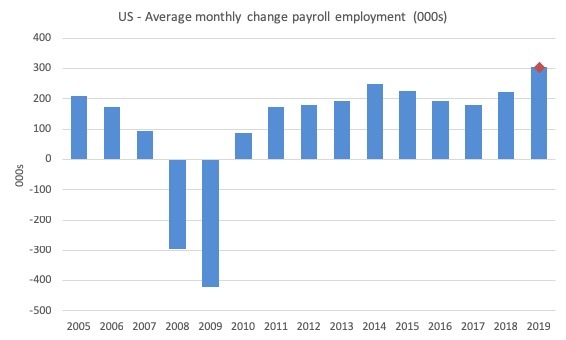 The next graph shows the same data in a different way – in this case the graph shows the average net monthly change in payroll employment (actual) for the calendar years from 2005 to 2019 (the 2019 average being the January observation at this stage). The slowdown that began in 2015 continued through 2017 and 2018 so far appears to have reversed that trend. The 2018 average was 223 thousand. The average change in 2017 was 179 thousand, down from the 192 thousand average throughout 2016. The average net change in 2014 was 251 thousand, in 2015 it was 227 thousand. The changes to the population benchmarks led to some significant shifts in the past estimates. The adjustments decreased the estimated size of the civilian noninstitutional population in December by 800,000, the civilian labor force by 506,000, employment by 488,000, unemployment by 18,000 and the number of persons not in the labor force was by 294,000. The total unemployment rate, employment-population ratio, and labor force participation rate were unaffected. Data users are cautioned that these annual population adjustments can affect the comparability of household data series over time. So, readers, it is an inexact science! The following Table shows the impact on the December-January changes (in thousands). So while total employment was estimated to have fallen by 251 thousand, the effect of the population benchmark changes was -488 thousand, which means that if we remove that impact the estimated change in employment would have been 237 thousand, more in line with the payroll survey findings. When these changes to the benchmarks are made, we have to be very cautious in making broad statements. 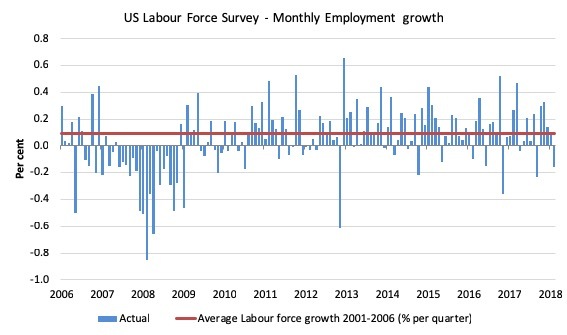 The best guess is that the US labour market improved in total employment in January 2019. Having that caveat in mind, in January 2018, employment as measured by the household survey fell by 251 thousand net (-0.16 per cent) while the labour force fell by 11 thousand (-0.01 per cent). As a result, total unemployment rose by 241 thousand and the unemployment rate rose by 0.1 points to 4 per cent. 1. There is still no coherent positive and reinforcing trend in employment growth since the recovery began back in 2009. There are still many months where employment growth, while positive, remains relatively weak when compared to the average labour force growth prior to the crisis or is negative. 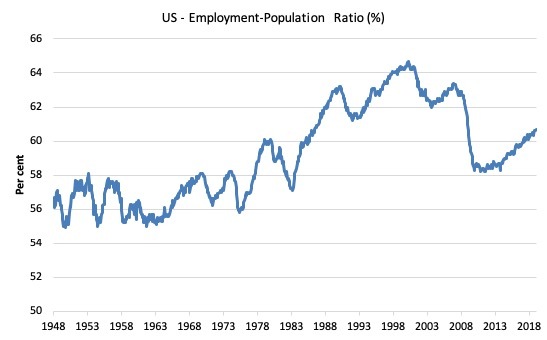 The following graph shows the US Employment-Population from January 1970 to January 2019. While the ratio fluctuates a little, the January 2019 ratio rose 0.1 points to 60.7 per cent. So while the population benchmarks led to a lower estimate of overall employment, the changed estimates to the working age population fell by more leading to a rise in the EPOP ratio. This time last year it was 60.2 per cent. So a larger proportion of the working age population are now in work. These estimates are also impacted by the changed population benchmarks as detailed in the Table above. 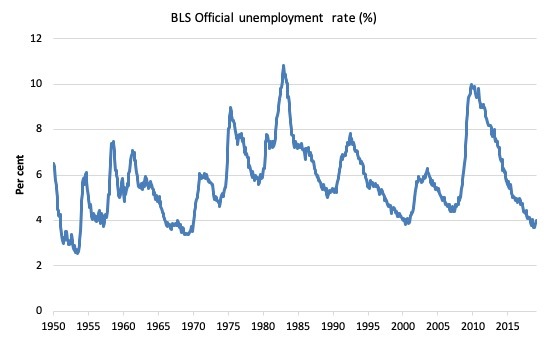 It is clear that the US labour market is reaching unemployment rates not seen since the late 1960s. The unemployment rate rose slightly in January 2019 largely because the participation rate rose by 0.1 points (adding to supply faster than employment added to demand). After a period of steady decline over the first part of 2018, it is now at 8.1 per cent having been at 7.6 per cent in December 2018. So the jump in U6 is likely to be the ‘Donald Trump Obstinacy on the Path to Humiliation Effect’ and we will see a reversal in that aggregate in February or March. That provides a quite different perspective in the way we assess the US recovery and challenges the view that the US economy is close to full employment. The current participation rate of 63.2 per cent is a long way below the most recent peak in December 2006 of 66.4 per cent. Adjusting for the demographic effect would give an estimate of the participation rate in January 2019 of 65.2 per cent if there had been no cyclical effects (up from the current 63.2 per cent). This would give an adjusted unemployment rate of 6.91 per cent rather than 4 per cent, if all the ‘hidden’ unemployed (since December 2006) were to be counted among the official unemployed. 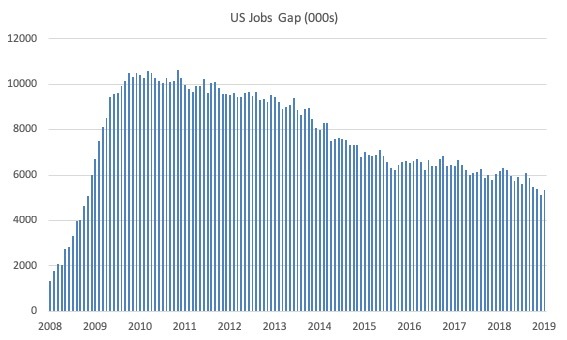 To compute these job gaps we have to set a ‘full employment’ benchmark. 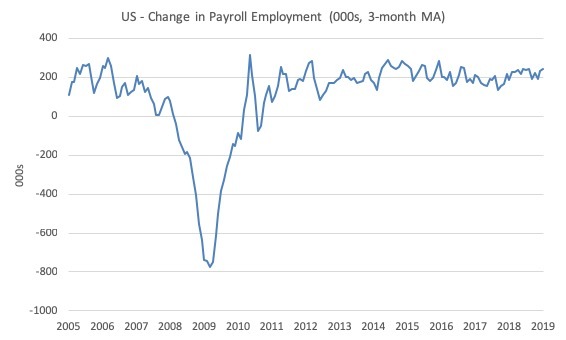 I have set this at 3.7 per cent, which is where the US labour market reached in November 2018. The actual loss of jobs between the employment peak in November 2007 and the trough (January 2010) was 8,582 thousand jobs. However, total employment is now above the January 2008 peak by 10,099 thousand jobs. The shortfall of jobs (the overall jobs gap) is the actual employment relative to the jobs that would have been generated had the demand-side of the labour market kept pace with the underlying population growth – that is, with the participation rate at its January 2008 value and the unemployment rate was constant at 3.7 per cent. This shortfall loss amounts to 5,350 thousand jobs. I updated my research into the cyclical shifts in employment at the main occupational levels for the US today. And the results are very interesting. In the past, I have demonstrated that the proportion of jobs in the total employment in sectors that pay below-average pay has increased. At that level we are unable to say whether these jobs in question were high-pay or low-pay. The next table helps to expand on that understanding. It shows the net job losses (in the downturn) and net job gains (in the recovery to date) for the major occupations in the BLS classification. I have sorted the occupations relative to median weekly earnings as at the fourth-quarter 2018. Low-pay is 75 per cent of the median. 1. 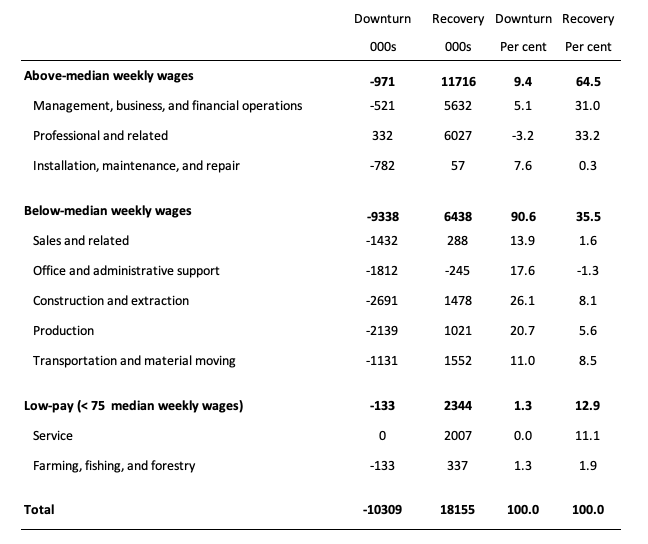 In the downturn 90.6 per cent of the jobs lost were in occupations that paid below median weekly earnings (1.3 per cent of those were in low-paid occupations). Very few jobs (relatively) were lost in the higher paying occupations. 2. Given 86.1 per cent of the total jobs lost in the downturn were in sectors paying above average pay. The inference is that the jobs lost were predominantly the lower paying jobs in those sectors (although we cannot strictly compare mean and median in a wage distribution given the skewness). 3. In the upturn to date, the net jobs added have not yet replaced those lost in the occupations with below median weekly earnings. 64.5 per cent of the net jobs added were in occupations with above median weekly earnings. 4. While only a small number and proportion of jobs were lost in the low-pay occupations, the recovery has seen a much larger number of those jobs being added. Of the 35.5 per cent share of below median earning jobs in the recovery the proportion that were in low-pay occupations was 12.9 per cent. 5. This tells us that there is a polarisation going on in the occupational employment structure with a bias towards low-pay jobs in the below median weekly earnings occupations and towards jobs in the above median weekly earnings. 6. That is there has been a hollowing out around the overall median pay levels. I am investigating that further. The January 2019 BLS labour market data release for the US tells me that the US labour market remains fairly robust. Caution should always be exercised given the volatility of the monthly data especially this month, given the changes made to the population benchmarks. Total non-farm payroll employment rose by 304,000 and the unemployment rate rose by 0.1 points to 4 per cent on the back of a 0.1 point rise in the participation rate. If the January result persists, then sustained reductions in unemployment will occur. While the US labour market is looking fairly robust there is still a substantial jobs deficit remaining which tells us that it remains some distance from full employment. And there has been a significant hollowing out of jobs in the median wage area (the so-called ‘middle-class’ jobs), which is reinforcing the polarisation in the income distribution and rising inequality. We’re investing in everything except our citizens. How does the United States Bureau of Labor Statistics define the working age population? Is it everyone aged 15 years and over? Is it everyone aged 15 to 64 years? I think this answers your question about what is the working age population.